In the age of Big Pharma, meds have flattened all before them in their virtual conquest of the mental health field. Over the years, antidepressants have come to be sold as virtual panaceas for just about any emotional trouble to which humans are prone. According to many observers, however, these drugs are wildly overprescribed, often for conditions that wouldn’t be captured even in DSM’s ever more capacious net. Over the last 150 years, we’ve seen waves of mass infatuations with psychotropic drugs—antidepressants being the latest. While all these drugs are different, their story arc seems to follow a predictable course. The chemical effect of psychoactive meds is only part of their impact. In fact, people often develop complex relationships with the pills they take. 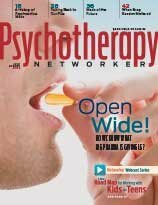 For many therapists, an air of mystery surrounds the role of psychopharmacology in mental health treatment. Here's a step-by-step tour of the complexities of the psychiatric consultation. Does our growing understanding of the brain and the prospect of further scientific discoveries mean there’s a new generation of magical pills on the horizon? Have They Lived up to Their Promise? After wading through the controversies and contradictions in the research literature on SSRIs, a critic of Big Pharma explains why he thinks these drugs may have gotten a bad rap. For therapists, giving a TED talk is the new professional milestone. Making a group practice work means taking on the challenge of becoming a boss. Many well-intentioned therapists have suggested that their clients just “let go” of hate, as if it were a heavy load that they could simply drop to the ground. Pioneering trauma expert Bessel van der Kolk shares his thoughts on the differences between public and private trauma. A new book investigates the worldview of a range of fanatics who’ve dedicated their lives to holding onto to their antiscientific and antihistorical claims. A woman in a life transition takes her son on an eventful road trip. Do We Know What Big Pharma is Giving Us?